1. Grate all the carrots and put it in any cup just right to hold this. Use this cup as a measure for the rest of the ingredients. Add the grated carrots to the rice cooker. 2. Add sugar (1/4 th. of the same cup used above). If you like halwa sweeter, add a little more sugar to the rice cooker. 3. Add 1 cup of milk. 4. Switch on the rice cooker and let the halwa cook. The sweet aroma will spread within a few minutes. 5. Add a few spoons of ghee to the half-cooked halwa and continue to cook. 6. The rice cooker will switch over to ‘Keep warm’ mode once the halwa is done. NOTE: If you continue to keep the halwa in the rice cooker, then it might become too dry. It’s better to transfer it to a serving bowl. 7. Garnish the halwa with finely cut almonds and cashews. TRADITIONAL STYLE GAJAR HALWA with Khoya & ghee!! 1. Peel, wash and grate carrots. 2. Chop cashewnuts. Blanch almonds in half a cup of hot water for five minutes. Drain, cool, peel and slice them. 3. Heat ghee in a pan, add grated carrots and sauté for five minutes. 4. Add milk, green cardamom/elaichi powder and cook on medium heat for five to six minutes or until the milk evaporates and the carrots are cooked. 5. Stir in the grated khoya and sugar and cook for 2-3 min. or till the sugar melts and mixes well, stirring continuously. Continue to cook for few minutes more till it turns rich deep red/brown color. 6. Garnish with chopped cashewnuts, sliced almonds and raisins. 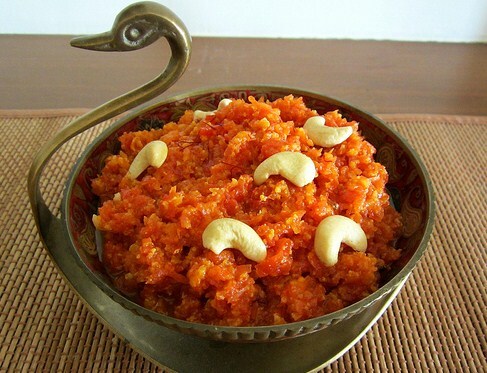 This yummy roasted carrot Indian dessert or commonly called "Gajar Ka Halwa" may be time consuming & tedious to make but it is definitely enjoyed by everybody who tries it. The wonderful aroma & taste makes you want more. Enjoy the hot gajar halwa plain or top it up with a scoop of your favorite ice cream and enjoy the hot-n-cold combination.